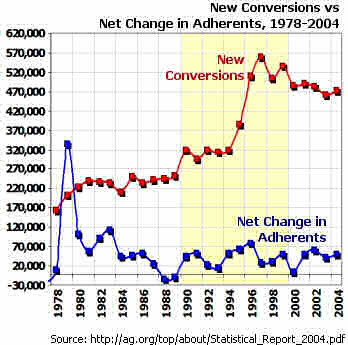 Not only are the new believers outstripping the net change in adherents, they seem to have no impact on the growth trend at all. If the data are accurate, we may be bringing folks to Christ in the A/G, but we’re not keeping them. I posted my entry, and sat back to watch. I received private confirmation of my data from a district officer and a little attention from fellow bloggers, but not much else. I notified the A/G statistician of my entry, just to be safe, and asked her to let me know if there was a flaw in my research. I received a thank-you, and that was it. In a recent news article on the A/G website, culled from a message he preached in the headquarters chapel, he notes that only 25% of new converts follow through to water baptism, and only 20% experience the baptism of the Holy Spirit. Further, only about 4% actually make it to the Sunday morning worship service. I noted in my article that George Barna had surveyed A/G adherents about their attitudes toward various church activities such as evangelism, worship, fellowship, and so on. He discovered that only 8% felt that discipleship was the single most important activity. In short: too few in the A/G champion discipleship. So, the A/G is now doing something about it. A commission has been established, Crabtree is heading it up, and a handful of other priorities are now on the agenda. Let’s hope it produces some results. During the annual Assemblies of God General Presbytery meeting held this past August in Springfield, Missouri, statistics were presented that revealed an alarming trend in the Assemblies of God that brought immediate action. According to AG Assistant General Superintendent Charles Crabtree, last year only 25 percent of new converts followed Christ in water baptism, with only 20 percent receiving the baptism of the Holy Spirit. Another alarming statistic is that of the more than 5.3 million stated decisions for Christ in the AG over the past 10 years, the reflection in Sunday morning service saw an increase of only about 222,000 — just four percent. As a result of these findings as well as other studies and preliminary actions, significant changes were proposed to and accepted by the General Presbytery. First, the Commission on Christian Education and Discipleship was created with Crabtree serving as chair. The current Commission on Discipleship as well as the Sunday School Agency were dissolved. In addition, a Small Groups and Discipleship Initiatives Department was established. This new department and the Sunday School Department will function under the direction of the newly created commission. “We have literally thousands of small groups going, but they’re not attached to an overall strategy of discipleship,” Crabtree says. Those concerned that Sunday School will suffer as a result can set their fears aside. The department is actually broadening its ministry to create curriculum and opportunities for Sunday School-style discipleship outside of the traditional Sunday-morning setting, such as home Bible studies. A new convert is like a new baby, Crabtree explains. Family and friends gather about, expressing support and concern, but the parents are the ones who train and nurture the child — as well as love the child despite his or her shortcomings. Churches need to be prepared for spiritual “babies” by training up spiritual mothers and fathers who understand the significance of their commitment. To listen to or download a discipleship message by Crabtree presented in the Assemblies of God headquarters chapel on Tuesday, August 15, 2006, see http://ag.org/. 1. What is that chapel sermon from? ie what chapel? 2. despite my chronology of this meme on my blog and my communication with HQ, I take absolutely no credit for this Are you not taking credit for the lack of AG discipleship or the response? 3. What is the reason for the aberration in 1979? 4. Do you know if there ever was a time that the numbers were consistently closer? Or is this just the way things are? Bro Crabtree will be speaking in my church Sunday. I believe he is my pastor’s father-in-law. I have read some of his stuff in my Berean courses. From what I read he seems like a pretty bright guy. I look forward to hearing him. What is that chapel sermon from? ie what chapel? The Monday morning chapel service at the Assemblies of God headquarters in Springfield, Missouri. I’ve always thought it to be the most nerve-wracking place in the world to preach because anyone speaking there will be heard by the top A/G leadership as well as the Springfield minions. I have never been asked to preach there. I’m not holding my breath. Are you not taking credit for the lack of AG discipleship or the response? I take no credit either for “discovering” the problem of conversion attrition in the A/G, or for “alerting” headquarters to it. The current response is, likely, the result of long-time pressures from pastors around the Fellowship talking with the Executives about this problem since the Decade of Harvest. What is the reason for the aberration in 1979? “Beginning in 1979 data was collected on the Annual Church Ministries Report. The change in source probably accounts for the large increase in reported adherents. So, reporting procedures and available data-sets account for the spike. It’s an anomaly. Do you know if there ever was a time that the numbers were consistently closer? Or is this just the way things are? Bro Crabtree will be speaking in my church Sunday. I believe he is my pastorâ€™s father-in-law. I have read some of his stuff in my Berean courses. From what I read he seems like a pretty bright guy. I look forward to hearing him. Brother Crabtree is a very bright man, and an able communicator. I appreciate him a great deal. Thanks for the detailed response. Number 2 was a bit of a joke. I know that you secretly are telling friends and family that you forced the AG to shift focus and if given the chance you would rub it in the AG’s face at said chapel service. The secret is out. I actually attend Church of All Nations in Boca Raton, FL http://bocachurchofallnations.com . Pastor Boykin is married to the former Beth Crabtree. Hey, if any one man could shift the entire A/G’s focus it most definitely would not be me. I doubt that man exists anywhere on the face of the Earth today. Not even Tom Trask can shift the focus of the entire A/G. When I began following Christ, while attending Calvary, I begged others for discipleship. I could not get anyone to help mentor me through my baby steps. I finally had to go out and start working my way through several books, including two different systematic theologies (something I’d never recommend a new Christian do). One of my main heart’s focus now is on mentoring others, either as new Christains, or ministers who haven’t had the chances I’ve had to learn hermeneutics and exegesis from the “school of hard knocks” known as maillists (another thing I wouldn’t wish on a baby Christian). I hear you, Steve. Unfortunately, most are not as self-aware of the need for mentoring as you were. This is a problem with mega-churches, especially, where even after attending for several years, I only know a handful of people in a given service. Large crowds, paradoxically, breed insularity. This is, I suppose, why so many large churches are on the small-group bandwagon. While this is good, the risk is that the small group may simply function as a smaller church and there’s still no guarantee of mentoring or discipleship. Especially if your small group isn’t blessed with a handful of people capable of mentoring you. While not a part of a “mega-church”, I do attend one that averages about 800 on Sun. morning. I have been part of a care group since they started about 2 years ago, but we recently had to change groups because of some personal problems with the group leader (his own, not something related to me). Now that I’m in a different group I notice the “mentoring” difference. I got where you were coming from regarding not taking credit. There’s a vain part of us (well, at least me!) that gets a little “chest-puffy” when the pastor includes in the sermon or announcements something that you mentioned to him that week, where you have been able to influence upper management. You have that sense of contributing something, even though you may feel like just another face in the crowd sometimes. As bloggers we LOVE to have our ideas out in the open and discussed. Why else blog? I once went to a church where one of the assistant pastor’s father-in-law was Brother Trask. Sadly, things did not work out there. I don’t recall if he came to visit. I wonder if one of the other reasons for our poor retention isn’t just discipleship, but also discipline. On most of the maillists I’ve frequented, where I’ve had the chance to speak with our more “mainline” brothers, the number one complaint of Pentecostals is our lack of discipline within the church. We tend to treat folks with kid gloves, until such time as they go so over the top they can’t be ignored any longer. We need mentoring, but mentoring also includes discipline when errors arise. Date and Time? I see a date and time on each comment just fine. Is it not showing up for you? I thought you added that after his post because I see it also. Rich, how did you do the screen shot rip thingy? I did a “Print Screen,” pasted it into Paint Shop Pro (my graphic editor of choice), selected the relevant area with a rectangle, changed my selector tool to “freehand” and deselected a portion off the rectangle so it would look “torn”, inverted the selection, deleted the sourrounding page contents, re-inverted the selection, applied a drop-shadow, selected a rectangle on a new layer to hightight the date/time, colored the new selection yellow and set the layer properties to “Multiply”. Cropped the image, resized slightly, saved as a JPEG, saved to disk, uploaded, and added it to my comment. My bad — I was using the stripped down, easy load version of your site (the one without the fancy colors and “designery”). When I checked it out again in the regular site, from a link in the e-mail sent to me when a comment is added to the post, I can see the date and time. Now, you probably know this, but when I look at your site with Firefox the post is OK but the comments are smooshed together/overlap so that you cannot read them. I’m not complainin’ or nuttin’, just lettin’ ya know. I use FF and it looks fine here. I cleaned up some stuff in the stylesheets … I hope everything’s fixed. But I haven’t heard about the comments being freaked out before. I wonder if anybody else is experiencing this. Now that Iâ€™m in a different group I notice the â€œmentoringâ€ difference. I’m not asking for you to share the private details of your group, but I’m wondering what kind of difference have you noticed? Are you confirming my observations, above, about the deficiencies of small groups, on average, to provide adequate mentoring for individuals? Regarding credit, yes, I’d be thrilled if Charles Crabtree called me on the phone and said, “Rich, your analysis was not only spot-on, but it lit a fire under everybody here at headquarters, we were buzzing about it for weeks, and the phones rang off the hook!” Yes, that would appeal to my vanity, and would be flattering. But in reality, our deficiency in discipleship has been pretty common knowledge among all A/G pastors and leadership for years. My numbers only stated publicly what many have not been not willing to say or provide factual foundation for in public fora (not because they’d take heat for it–maybe they would–but primarily because there’d be little to gain from griping and whining). I have the luxury of not having credentials of any sort and not having an axe to grind. So I can say it not only with impunity but without worrying that I’ll start a grass-roots movement. So, my blog post wasn’t “news” in any sense of the word. I merely tapped the veign of the current A/G zeitgeist and bled out a few charts. And, more on the flattery and credit thing: one of the projects I’ve worked on for years at my job is Preaching Today, a sermon and illustration resource site for preachers. Back before I started working in the same department as PT I used to freelance illustration material for them. It was nice little freelancing sideline, and one of the intangible benefits is hearing a sermon illustration you submitted get preached at you in a service. That’s happened to me a couple times, and I’ve found several references to my illustrations in sermon transcripts online. There’s a special enjoyment derived from knowing that a story you’ve told has been used to facilitate the preaching of the Word. And speaking of “influencing upper management,” that’s another special joy of mine. I gave up long ago trying to “spearhead” changes in ideas, strategies, and direction. I no longer try to get management to “listen to me.” Instead, I’ve found a knack for submitting ideas in a non-threatening, off-topic sort of way in conversation with management that helps the person I’m talking to think the idea was theirs all along. Instead of saying, “We should buy the Widgetizer 5000, it will revolutionize our product line!” I forward an email detailing news about the Widgetizer 5000. Or I’ll mention it in a hallway conversation, “Hey, you’ll never guess what happened with Widgets-R-Us when they bought one of the new Widgetizer 5000s….” Or I’ll pose a hypothetical, “What do you suppose would happen if we managed to land a new Widgetizer in our building?” “Oh? What’s a Widgetizer?” Before you know it your manager is talking up a storm about this cool Widget gizmo he’s discovered. Or I’ll make these sorts of suggestions to someone who does have influence, and watch things develop from afar. I think of it as a sort of subversive leadership. It’s great fun. As bloggers we LOVE to have our ideas out in the open and discussed. Why else blog? Yes, as a writer I do love to spout ideas and provoke discussion. Unfortunately, in mailing list and online discussion fora, too often my writing tends to end the discussion. I don’t know if it’s because I tend to research my answers and sum up all the positions while presenting my case or because after writing a Magna Carta on the topic at hand, everybody’s simply to exhausted to go on. But I got tired of ending discussions and not getting dialog in return. This blog is part of my experiment at expressing myself in a forum that is “evergreen.” My posts now will not disappear into the inbox bitbucket and I can always return to polish and update my ideas. My other reasons for blogging, of course, are to simply get more words on the page. As with most things, writing is a skill that only improves with great practice. And unlike other things, it deteriorates rapidly when unused. So, I write to hone my writing, to sharpen my thinking, to subject my ideas to public scrutiny and correction, and, most importantly, to do what God has apparently designed me to do. To borrow from Eric Liddel in Chariots of Fire: When I write, I feel God’s pleasure. Perhaps, better, I should say: When I blog I hear God’s laughter. I wonder if one of the other reasons for our poor retention isnâ€™t just discipleship, but also discipline. Amen. We need a healthy reminder of 1 Corinthians 12-14 on a regular basis. I couldn’t agree more with what you wrote, and I couldn’t add to it either, much as I’m usually tempted to try to do so. WRT mentoring in small groups, establishing and maintaining the mentoring relationship has more to do with making a “mentor match”. Obviously in small groups you just don’t have as many opportunities to make good matches due to the numbers thing. At the same time you don’t necessarily want to have musical chairs between care groups either, as relationships to get beyond the “Hi howya doin'” mask we ordinarily have up during Sunday mornings take time AND trust. In my first care group I never really seemed to get beyond the initial social pleasantries with any potential mentors. Care group dynamics and nurturing them along can be very tricky, yet they are vital for large churches. While mentoring can be a good result of care groups, their primary focus should be on strengthening relationships between a few select brothers or sisters so that you have a sense of family (and all that entails!). The family aspect was a given for the early church, but today’s church resembles more of a shopping mall (pick-n-choose) than a brotherhood/family. When people feel like they’re family they tend to not wander, have a feeling of accountability, and can build relationships of trust. We just need to remember who’s our Daddy! We have been using Bill Hullâ€™s books and Dallas Willardâ€™s books to help us focus our discipleship program at Bella Vista Assembly of God. I prefer to keep my name anonymous when conferring with anyone regarding my comments. Let me give you some further fodder for discussion. 2. The ratio of water baptisms recorded by churches on the annual church ministry statistical form to church attendance is always much higher for Hispanic and other ethnic minority congregations. 3. The same as above can be said for reported conversions and reported Holy Spirit baptisms. 4. Discipleship must be taking place at a phenomenal rate among ethnic minority congregations in the U.S.
My observation is that both the national office and the geographical do the best they can to try to include ethnic minority pastors in the decision-making process, but they are woefully lacking in cross-cultural communication skills to really and truly understand what the ethnic minority pastoral leadership is trying to say. That’s because our national and geographic leadership are entrenched in the American cultural mechanisms of business design, strategic planning, and other typically American ways of addressing issues and solving problems. That’s not a criticism. It’s just the way it is. Rich, My name is Mark Kelley, I am the dicipleship pastor at Bella Vista Assembly of God. I found your discipleship article very good. My pastor, Jonathan Watson, and I met with Br. Crabtree a week ago and discussed this very issue. I agree that our national office is woefully underpresented by any but the majority (whites). And males. And, for my part, that is a criticism. And I have criticized the A/G elsewhere for having a patronizing attitude toward minorities — though we are further along in this regard than we have been in decades past — and somewhat worse than at our founding. I listened to an interesting presentation by an historian from Northwestern University who challenged to think of which of our “founding fathers” we were best descended from, the racist Charles F. Parham, or the black William J. Seymour. Seymour was a student of Parham’s, but could not sit in the classroom with the other white students, I’ve read that he had to stand out in the hallway during the lecture. Yet when Seymour led the Azusa Street revival, it was at once celebrated and reviled for being multi-ethnic. But for a long time that I worked at the A/G Headquarters (from 1991 to 1999) the only black man to work there was on the custodial staff. By the way, there’s more discussion of these stats in the comments section here. I’ve corresponded with Brother Crabtree about this as well. He seems very open to new ideas and approaches. I hope your discussion went well. From my own perspective and experiances They hang some of their Pastors out to fail for numbers sake and that of what others pastors say with little true mentoring. I know because I was black balled from the very begining because of one pastor making false accusations about me. I know for my true mentor that I respect Highly told me that they didn’t want to license me at frist until he stood up for me then they gave me my Christan Wokers Papers. Then a couple years later license to preach do to him once again standing up for me. Then he left the state I was in at the time for another calling to another church. After that everything went down hill from there until I lost my license. As the Lord as my witness I was even told by my Distric Sup. of that state When my wife and I went to talk to him of my concern quote unquote, ” We think you should be an Assistant Pastor and if you are successful in that we don’t guarantee we will ever let you Senior Pastor in this state with no thought of what we felt God telling us. Well needless to say my wife and I left there very discourage and truthfully my wife has not really gotten over it and has basicaly given up to the point that as I am seeking to start over she just says well we will see if you can even get an interview after all no one believe in you but God why try!!! I was doing a search and came across this blog post. It is interesting that the focus is on the lack of discipleship. While I agree that the A.G. churches could use a curriculum with some foundations of doctrines, as most in the classes I have attended prefer out-sourcing their Christian education to the likes of either the Word of faith or Emergent teachers, it might do you some good to re-visit the question of whether such as do not seek discipleship are even saved. I will not bog you down with the plentitude of scriptures dealing with the true saints’ desire for and adherence to truth, or a lenghty treatise on the perseverence of the saints. I will ask you, however, to recollect Jesus’ definition of a true believer to Nicodemus. To be born again requires a soveriegn work of regeneration by the Holy Spirit. This is not because the so-called convert prayed a prayer, confessed with his mouth Jesus as Lord, or any of the standard tell-tale conversion signs the church is seeking today that they might add one more name to their decisions list. If true faith does not move the heart of the hearer of the gospel to repentance and trust, whatever else he does will not save him. And what is true faith? Jesus said the Holy Spirit would convict the world of sin, righteousness and judgement. How can He, if we do not preach these things (the gospel)? Maybe you have a lack of discipling because you have a lack of true disciples?